As part of our three-part series Circus Talk will run this year on the 25th anniversary of Cirque Éloize, we end with a review of their latest creation HOTEL. There’s a bustling of action around the front desk. A celebrity comes in laden with bags, a tourist bumps into a maid. The maître d’hôtel is trying hard not to lose it completely and someone steps on the handyman’s dog. It’s chaos of course, but it’s calculated chaos, brilliant comedic fodder and circus that hits the spot. 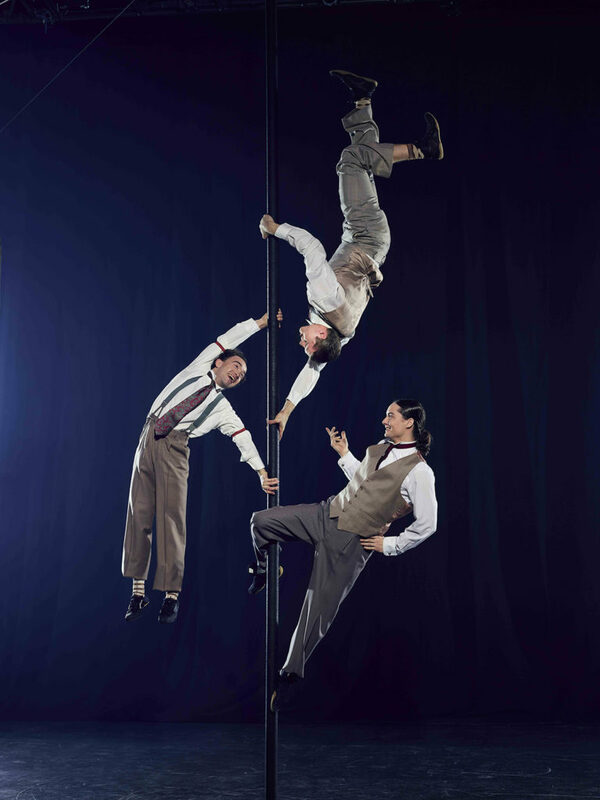 Montréal-based company Cirque Éloize, known for its snappy theatrical brand of contemporary circus, is celebrating its 25th year by staging a new creation,Hotel– a co-production with TOHU and Place des Arts, staged at Théâtre Maisonneuve. 25 years is a long time no matter which way you slice it, but in the fast-paced, quick-change world of circus it’s a veritable lifetime. Jeannot Painchaud, President and Chief Creative Officer, says his key aim in founding Cirque Éloize has always been to reinvent the discipline. He believes that Cirque Éloize shows playing in theatres, as opposed to traditional big top tents or on the street, was in many ways the genesis of contemporary circus as we know it today: an amalgam of acrobatics, drama, dance, live music and comedy. Along with big sister company Cirque du Soleil, Cirque Éloize went some way toward shifting the public perception of what circus can look like, and defining the Québec style. They also innovated on the form and technique of circus; Cirque Éloize co-founder Daniel Cyr invented the Cyr wheel and according to the company it’s now practiced by around 100 professional performers, 30 of whom were trained by Daniel Cyr himself. So it’s fair to say that the company has a vital place in the international circus eco-system. One of Cirque Éloize’s key strengths is finding energetic young performers who are lithe, multi-talented, full of energy, ready to learn and able to spend time on tour. I like to think of Cirque Éloize as a kind of incubator for the international circus world, taking the best raw talent available and turning them into top-notch performance-ready artists set to take on the world. Cirque Éloize’s DNA is probably present in every contemporary circus company on earth, either directly or indirectly. Their shows are almost always extremely well-rehearsed, nicely paced and glossily-produced. It’s not necessarily life-changing circus, nor does it need to be. Its productions are purposely crafted for a wide range of audiences — both circus aficionados and neophytes alike — and have been embraced by over fifty cultures worldwide. This results in a wonderfully democratic approach to circus that can please existing audiences and help grow new ones. Circus for everyone is not a bad thing. Cirque Éloize is in a unique position to appeal to comedy fans, bunheads and theatre aficionados in equal measure, growing the circus slice of the pie in the process. To serve their wide fanbase, Cirque Éloize tours frequently. Its creations — like iD, Cirkopolis and Saloon— have visited 552 cities, 55 countries, done 5,500 performances and 1600 events. When they sat down and figured it out, the directors of Cirque Éloize realized they’ve had around 130,000 hotel stays over the years. Even Cirque Éloize’s head office and creative studio at home in Montreal are steeped in the traditions and history of travel (they’re located in the Gare Dalhousie, a historic building in the heart of Old Montreal, which was the departure station of the first train going from Montreal to Vancouver in 1889). Touring frequently as they do, the company sees more of the insides of hotels than just about anyone, save for, perhaps, the travelling sales rep. This familiarity led them to consider the artistic potential of the hotel lobby and all of the characters that come through there; the divas, the hotel managers, the long-lost brothers, the tourists and suited executives. As the programme text neatly puts it,Hotel is the story of a place, but it’s mostly a place full of stories. The hotel lobby is a space where strangers gather for fleeting moments within their own journey. Thematically it fits nicely with Cirque Éloize’s own position in the circus landscape; a connection point between so many artists, schools, companies, festivals and theatres. It’s a fitting artistic framework for their 25th anniversary production. 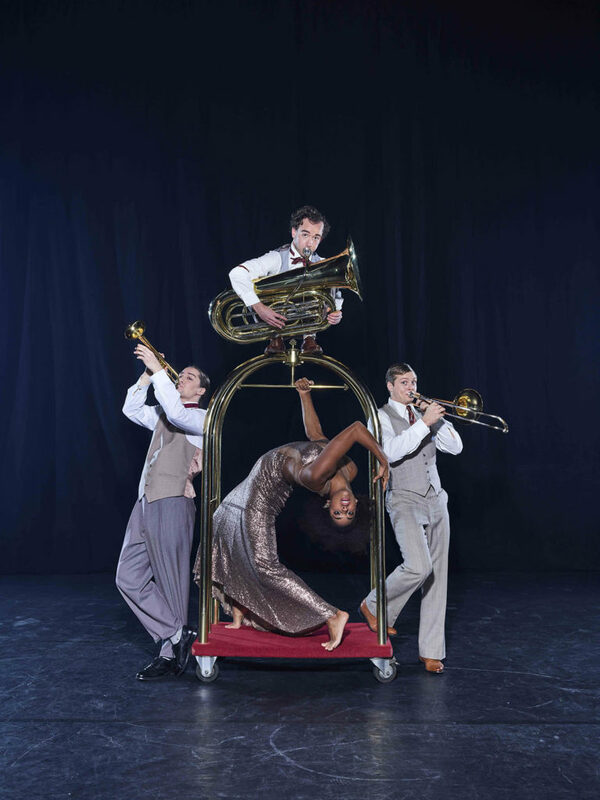 Hotel features 12 multi-talented performers who are not only in possession of their own distinct strengths and talents, but can also play musical instruments and master a successful group act with dozens of golden hula hoops of various dimensions. Importantly, they all have the acting chops to sew the narrative together effectively. The tall and striking Tuedon Ariri (Canada), with her ultra-bendy spine and towering legs, has a wonderfully sculptural approach to the straps. She played the celebrity of the show, strutting in with sunglasses and an entourage, occasionally popping out an operatic stream of coloratura soprano. Usually I find juggling a bit nerve-wracking to watch, but Philippe Dupuis (Canada) had a smooth and assured technique to assuage any audience fears. His most impressive juggling came in the second half of the show, when he used the upper set piece as an angled bouncing surface. It was cleverly choreographed and nicely executed. César Mispelon (France) has such a distinctive physicality; short and trim, with a head of cherubic curls, and he uses it to his advantage. In hand-to-hand, he’s a nimble little needle flying through the air in increasingly improbable ways. Emma Rogers (US) is the romantic heart ofHotel; under the gently flickering strobe spotlight, she transforms into every actress in every classic Hollywood film you’ve ever seen. She’s a strong generalist, performing hand-to-hand, Chinese pole and hula hoop with ease. She is ably partnered by the broad-shouldered Andrei Anissimov (Canada/Russia). The bearded Jérémy Vitupier (France) plays the hapless hotel manager with aplomb and great comedic timing. He also sets the gold standard for how slack a slackwire can get while still supporting the weight of a grown man. Antonin Wicky (Switzerland) is such a treat to watch; his clowning act with stacks of unwieldy suitcases provided the best laughs of the show, and put the set and props to great use. Bonus: anyone who can convincingly flirt with a pink suitcase gets an A+ in my book. Una Bennett (US and UK), with her puff of fluffy curls sitting atop her head, is a pint-sized dynamo. Look up her videos on Youtube if you want to see an approach to aerial rope that feels innovative, fresh and intensely musical. It’s a bit of a shame that she wasn’t given more compelling musical material to work with for her big rope act to tease out its emotional threads a little more: it’s clear that she is a highly lyrical mover who is driven by the emotion and dynamics of her musical accompaniment. The fact that she also pops out a very serviceable trumpet solo at the end ofHotel rather proves my point. Cory Marsh (Canada) and Cooper Lee Smith (US) offer us a strong Cyr Wheel opening, joined by Julius Bitterling (Germany) on hand-to-hand and tenor saxophone. The score, created by the well-known musical director Éloi Painchaud (Saloon, Louis Cyr, La guerre des tuques 3D), is elegant and jazz-inspired. The show’s compositions are performed by the accomplished Sabrina Halde, member and cofounder of the Groenland group. Her voice sets the tone of the show, and carries its narrative when it starts to disintegrate around the edges. She plays piano and ukulele, but the star instrument truly is her voice – an iron fist in an understated velvet glove. The timeline ofHotel is not necessarily fixed or linear; the set has strong nods to 1920s Art Deco but provides us with flashes the future, with occasional stops in the 1970s. There is a temporal layering of time that is emphasized by the costumes and lighting effects. The staging is driven by Emmanuel Guillaume, known for his sensitivity and comedic approach. ForHotel, he created a distinctive diamond-shaped set piece, flanked by scalene triangles on either side that transform into slides, stairs and hotel bedrooms by turn, depending on how the performers interact within the space. The front desk stretches its way across the entire stage, cleverly offering the performers an extra surface to work with. There are just couple of weak spots inHotel. One I feel compelled to mention is the Chinese pole act, in which 9 out of the 12 performers whizz around, hopping on and off the poles but not doing much of consequence. It’s like watching a preschooler try to dress themselves; there’s an awful lot of movement going on but nothing much actually happening. Chinese pole should be dare-devil and gravity-defying, gasp-inducing even, but this was not. Why? Perhaps it was that the poles weren’t very high? It just felt a bit flat. All in all though,Hotel is a stylish, upbeat, technically-satisfying ode to travel that is sure to resonate with audiences all over the world. Rebecca is a writer, critic, commentator and communications consultant based in Montréal. 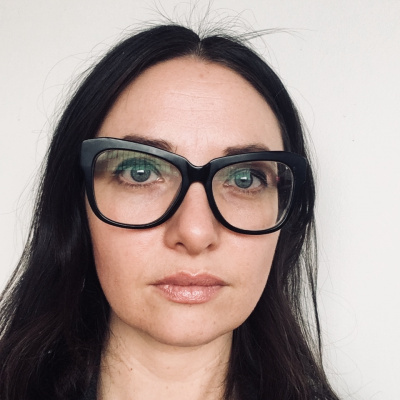 She has worked across a mish-mash of arts and design disciplines over her 15 year career—contemporary dance, circus, data visualization, opera, visual art, digital storytelling, ballet and literature. Originally from NZ, she’s spent the better part of the last decade living and working in the US and Canada.